guided archery hunters for over 25 years. His vast outdoor experience and highly-qualified outfitting team ensure you will experience a dream hunt that will exceed your expectations. 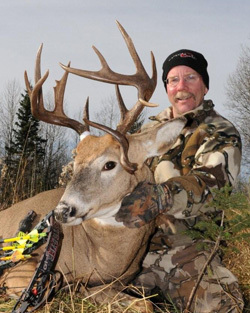 We provide fantastic hunts for bruiser whitetail bucks, huge black bear and giant Canada moose and have a variety of packages available for any budget and preferred hunting style. Our drive- to camps are located in semi-remote Forest Fringe regions of Saskatchewan’s vast agricultural regions, around 200 miles north-east of Saskatoon. The deer and bear hunting in this region is fantastic. With thousands of acres of private land and nearly limitless and exclusive regions of Provincial Forest at our disposal you’ll quickly discover why Saskatchewan is known as a hunting paradise. Our most adventurous hunts are conducted in truly remote wilderness regions, some of which nearly border the Northwest Territories. Our rustic tent camps and cabins are way off the beaten track, accessible only by ATV’s, Argos or float planes. You will experience excellent equipment and food, comfortable accommodations and great service in the back country. If you are looking for world-class bowhunting with a proven outfitter and top-notch guides please contact me for more information on our all-inclusive hunting packages. Successful June bowhunts for huge bruins have earned me a reputation as “the go-to guy” for tremendous trophies and unforgettable hunting and fishing action. 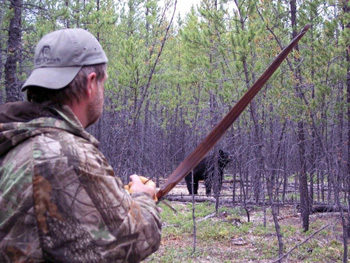 Remote, well-equipped tent camps provide access to un-hunted bears. Their size and fearless nature will amaze you. 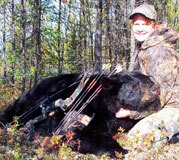 Our hunters usually experience 100% shooting opportunities and our success on huge bears is legendary. 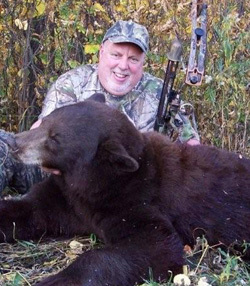 20"+ trophies are taken each year by hunters willing to pass up bears that would easily place in the P&Y record book. Fish species: pike and possibly walleye, lake trout, arctic grayling. Hunt duration 6 days. 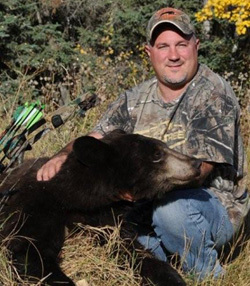 We also have some outstanding Fall Bear Hunts too! Call us to find out. 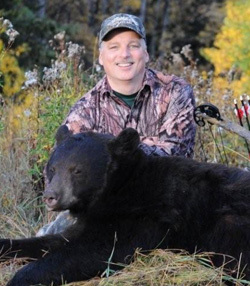 Located a 6-hour drive north of Saskatoon, this camp will feature excellent bear hunting and pike/walleye fishing. A 2007 scouting trip has me in awe at the potential of this excellent area for big bruins and color-phase bears are common. July and August finds me in the Arctic, guiding fishing clients for hard-fighting trophy Lake Trout and the world’s biggest, scrappiest Arctic Grayling. Tukto Lodge provides fantastic fishing, rafting and canoe trips in Nunavut and the North-west Territories. A fishing trip to the Arctic is an unforgettable (and highly addictive) adventure in one of the world’s most fascinating and untamed regions. Check out www.arcticfishing.com for info on this great camp. "The world's best ice fishing is on Tobin Lake, Saskatchewan in late winter. You'll catch GIANT Northern pike daily with my friend Kurt Stein at Big Strike Outfitters. Check him out at www.bigstrike.ca Fully guided trips with Kurt are afantastic winter adventure!" I will be offering a very exclusive fly-in bowhunt for giant Canada moose in the extreme northern regions of Saskatchewan. Huge bulls inhabit remote lake and river systems here and these late September rut hunts will be extremely productive. As the general manager of Canadian Trophy Quest Ltd. I'm committed to providing excellent bowhunts for Saskatchewan whitetail deer. Our area comprises roughly 400,000 acres of famous "Forest Fringe" habitat that provides nutrient-rich agricultural crops bordered by limitless expanses of Provincial Forest security cover. This area is well known to produce giant bucks. Chances are excellent to take home P&Y class trophies and a shot at an occasional monster buck is a real possibility. Many portions of our area have never been hunted. 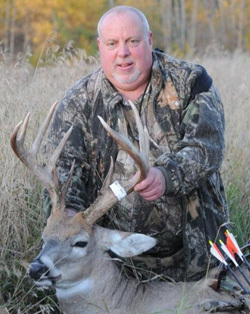 Bowsite.com owner Pat Lefemine took this giant-bodied 150" 9-pt on one of our early season Bowhunts in 2011. 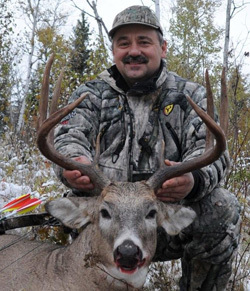 The Bowsite "Live Hunt" shows you a day-by-day account of a typical bowhunt. Pat kills this giant-300lb whitetail on Day 4 of his hunt. Click this Link to see the hunt and the Kill, captured on Video! The fully modern lodge is located 200 miles north-east of Saskatoon. During 6 full days of hunting you'll enjoy excellent food and a relaxed family atmosphere. We have new and reliable equipment, stands and blinds. Our professional, hard-working guides and support staff are committed to making your adventure successful and memorable. 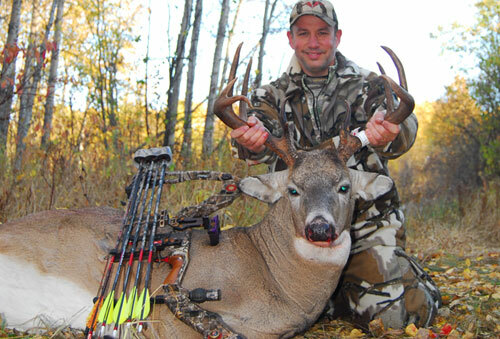 We are experienced bowhunters and know what it takes to put you in bow range of trophy bucks. Please visit our web-site www.canadiantrophyquest.com for more info on season dates and pricing. Please give me a call for more information, references or space availability and I wish you the best of luck in all your outdoor pursuits.